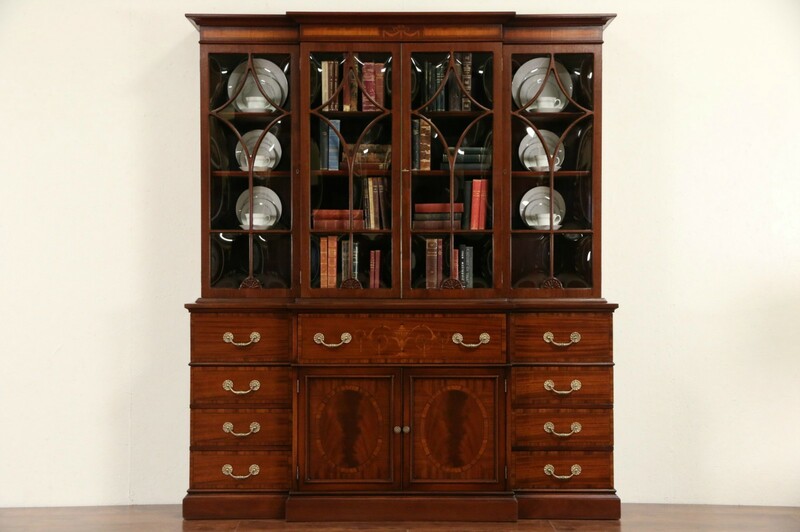 A classic breakfront china cabinet or bookcase has a pull out desk with gold tooled leather. The finish is in excellent condition on mahogany, inlaid with rosewood and ebony banding. American made vintage furniture from the 1950's, no maker's signature survives. The removable bookcase section has grooved shelves to display plates, if desired. There are individual convex glass panes and the locks and key work. Heavy weight brass hardware is original. Measurements are 6' wide, 16" deep and 84" tall.